This is the most prominent of two ring cairns that are in close proximity to each other. 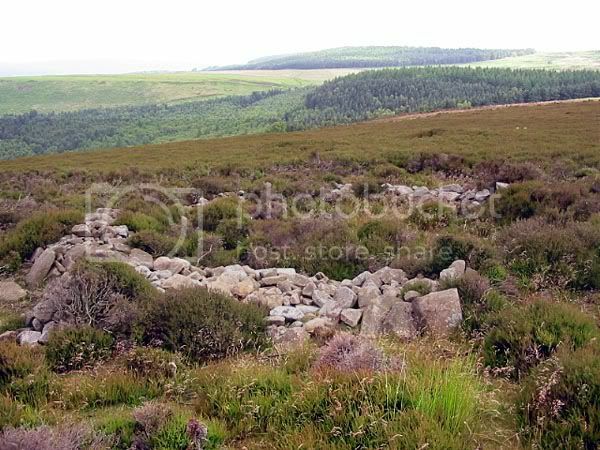 Beeley South 2 or Beeley North being nothing more than a hard to distinguish heather covered ring only detectable underfoot in the thick vegetation. The rubble ring of Beely South 1 is however very prominent and many features can be made out even though it is only a matter of several metres away. Measuring around 9x7m externally the rubble ring is on average 1.5m wide. Kerbstones are visible especially on the downhill side of the ringcairn in the west. On its southern edge is a gap in the bank and a small cairn has been added here, Barnatt suggests the ringcairn had been robbed in order to build this cairn. Radley excavated the site in the mid 1960's and although he found what could have been the remains of two cists in the ringcairns interior (both empty apart from one piece of undated prehistoric pottery). He suggested that the site was a possible hut circle. Barnatt however disagrees with this and points to the ring once being continous, as previously mentioned there is a gap in the south of the monument for the construction of a cairn, as two courses of drystone wall survive underground across this gap. As for the cists being empty he points to the offerings left in them as perhaps being votive ones that left no trace and no phosphate samples were taken. Also habitational debris was not recorded during Radley's excavations. Located on access land close to the other Beeley monuments is a little misleading when it comes to getting there, as there is no access to the moor from the Hellbank Plantation side. A long walk through the heather moorland of Falling Edge is required through the access gate next to Wraggs Quarries (see directions for Raven Tor Triple Cairn). A gps or good compass work is required.